Uterine fibroids are a surprisingly common condition for many women, and yet, they are one of the most misunderstood and misdiagnosed. 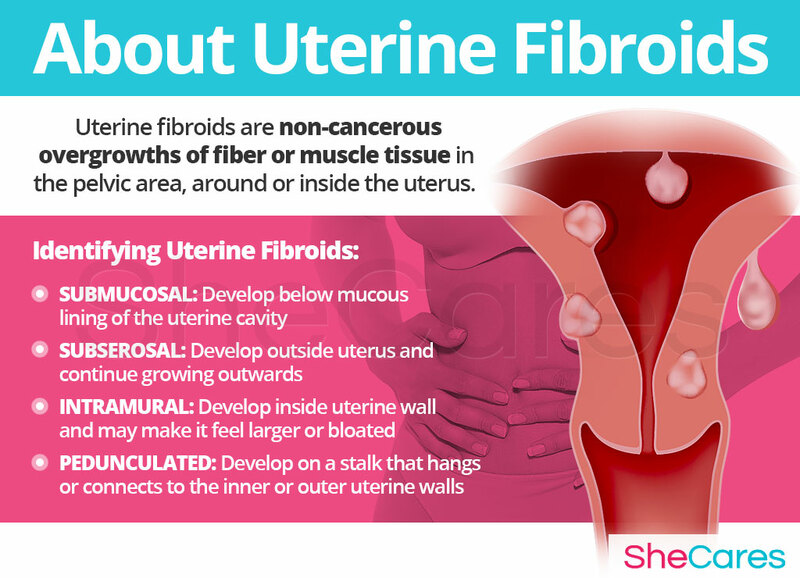 Uterine fibroids are benign tumors, made mostly of muscle tissue, that grow seemingly spontaneously around the uterus. While they are typically asymptomatic, in certain cases, they can become a chronic annoyance and cause a great deal of discomfort and pain. Furthermore, because they are so often misdiagnosed, sometimes they grow slightly in size, enough to start causing discomfort in the women who have them. During certain delicate stages of a woman's reproductive life - such as pregnancy, menopause, or even the days before her period - a great deal of hormonal fluctuations take place, which can affect the symptoms caused by uterine fibroids and may stimulate or slow down their growth. Fortunately, there are ways to manage uterine fibroids during these transitional times. Continue reading to learn about uterine fibroids causes, risk factors, symptoms and signs, prevention and treatment options. Some statistics point out that up to 70% of women may have uterine fibroids by the age of 50, whether diagnosed or undiagnosed, but some of them report no symptoms. More than 200,000 hysterectomies (surgical removal of the uterus) are performed every year due to uterine fibroids. Uterine fibroids are more common in women who are nearing the menopausal transition (early 50s). Uterine fibroids, medically termed uterine leiomyomas, are defined as non-cancerous overgrowths of fiber or muscle tissue in the pelvic area, around or inside the uterus. While exact estimations vary greatly, it is estimated that at least 25% of women develop fibroids at some point of their reproductive lives. The vast majority of them will not present any symptoms, and in many cases, the fibroids are discovered as part of routine pelvic or ultrasound exams. However, some women may see their fibroids grow unusually fast or become particularly large. While it is highly unlikely this will mean an increased risk of any type of cancer, the presence of large fibroids will likely result in pain, heightened menstrual discomforts, or fertility problems. Uterine fibroids are classified according to their specific location inside or around the uterus. While they are – in a large majority of cases - asymptomatic, the intensity of the symptoms they produce - if any - will depend mostly on their type and their size. In order to be able to prevent, treat, and slow down the growth of uterine fibroids or myomas, it is vital to understand first the mechanisms behind their appearance. Please continue to the following section to learn more about the causes of uterine fibroids. Learning about the causes of uterine fibroids provides the key to understanding how to prevent and treat this troublesome symptom. While the exact causes of uterine fibroids are not completely understood yet, most doctors and researchers believe hormonal changes and genetic factors are the primary cause of uterine fibroids. In addition to these completely normal hormonal causes, other factors and medical conditions can, in more rare instances, cause uterine fibroids. Continue reading to learn more about both hormonal and other causes of uterine fibroids. Hormones are chemical messengers that control every organ in the body. In particular, the hormones estrogen and progesterone are in charge of making menstrual cycles and reproduction possible. These hormones influence appetite, sleep, and sexual desire, and they stimulate the growth of several reproductive tissues. When the balance between these two hormones is disrupted, organs don't receive the correct signals to function adequately, and the excessive production of uterine tissue may be encouraged along with other hormonal disorders. In this sense, we can say that uterine fibroids are caused largely by the hormonal fluctuations during the transitions women go through during their reproductive life. Hence the reason why uterine fibroids usually appear or grow faster during times of significant hormonal imbalance - PMS, menstruation, pregnancy, and menopause. The fluctuations in estrogen levels during these stages cause fibroid tissue to grow. Furthermore, there are also specific hormonal phenomena according to the stage of a women's reproductive life that could influence the appearance of uterine fibroids and potentially slow down or hasten their growth. In addition, the intensity of the symptoms caused by uterine fibroids may also be exacerbated around PMS as well as during pregnancy, the post-partum period, and the arrival of menopause. PMS is a consequence of hormonal fluctuations linked to the menstrual cycle. It is a collection of symptoms, such as mood swings, pelvic pain, and bloating, which may be exacerbated by the presence of uterine fibroids. In addition to the cyclical symptoms experienced during PMS, women experience specific transitional periods that are strongly linked to the growth of existing uterine fibroids, as well as the appearance of new ones. Puberty is the stage in which a girl's body begins to produce reproductive hormones, and some factors surrounding puberty may influence a girl's chances of developing uterine fibroids. Pregnancy leads to extreme changes in the production of reproductive hormones, which along with other factors, such as stress levels, can influence the development of uterine fibroids. Post-partum and breastfeeding is another stage where reproductive hormones are imbalanced, which may affect the symptoms caused by uterine fibroids. Menopause is the stage in a woman's life when production of reproductive hormones starts naturally dwindling, until they reach their minimum and a woman's fertile period ends. 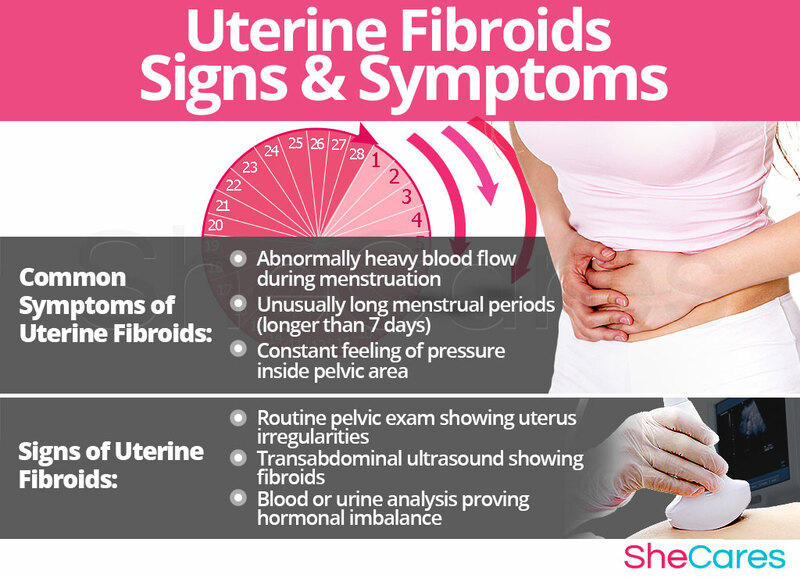 The hormonal fluctuations during this phase may affect both the growth and the symptoms provoked by uterine fibroids. While hormonal imbalance – in particular, excess estrogen – seems established as a main cause, the exact factors that determine the appearance of uterine fibroids, or their propensity to produce more severe symptoms – or, on the other hand, to be completely asymptomatic – are still largely unknown and under debate. However, experts have pointed out the existence of certain factors that seem linked to higher chances of suffering from uterine fibroids. 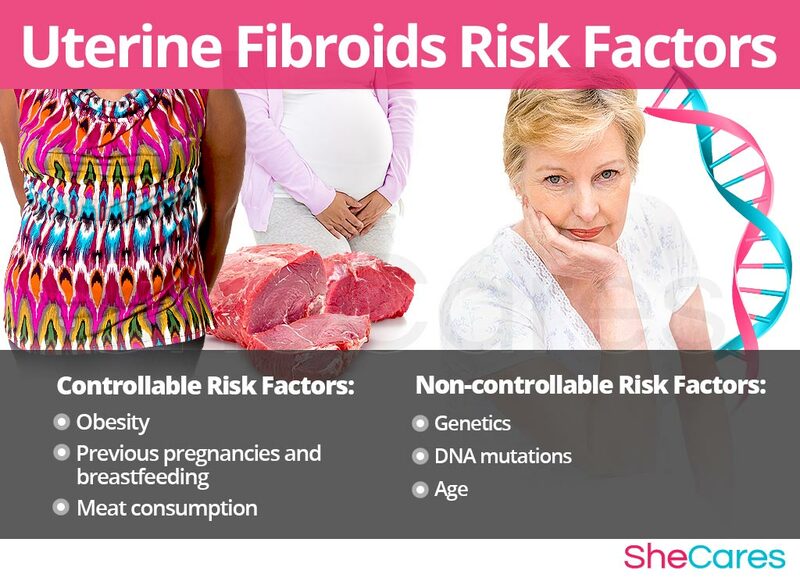 Please continue to the next section to learn more about risk factors for the development of problematic uterine fibroids. Some women are more likely than others to suffer from uterine fibroids for inherent health and behavioral reasons. These predisposing factors can affect a woman's hormone levels or increase her chances of suffering from more severe, faster-growing forms of uterine fibroids. Continue reading to discover the symptoms and signs of uterine fibroids to be able to recognize them and choose a treatment specific to their cause. Because the discomfort caused by uterine fibroids is highly dependent on the specific type, size, and location of each one of them, the way each woman experiences their symptoms is highly personal. Furthermore, many women experience no symptoms at all. However, women who do end up experiencing symptoms tend to experience certain common or easier-to-recognize ones. To diagnose and identify the symptoms caused by uterine fibroids, a doctor must typically perform four procedures. First, they should review the patient's medical history; then, they should conduct a physical exam followed by a pelvic exam. The doctor may then order additional tests if considered necessary. In certain extreme cases, when uterine fibroids are left untreated and grow unusually large, they can lead to certain complications. However, it is important to remember that in the overwhelming majority of cases, they will not require any serious medical intervention and will respond better to inhibiting their growth. The possible, but uncommon, complications of uterine fibroids can include miscarriages, fertility problems, and low-birth-weight babies. Women who experience severe or frequent symptoms caused by uterine fibroids may wish to treat or prevent them. Likewise, women who have recently been diagnosed with them and wish to avoid them in the future or to make sure they don't develop fertility problems may want to slow down the fibroids' potential growth as quickly as possible. Keep reading below to learn about how to prevent and manage uterine fibroids. While there is no single way to completely prevent uterine fibroids, just as there is no way to stave off hormonal process, there are a few steps that a woman can take to lessen her chances of developing uterine fibroids or lessen her chances that these will grow rapidly and provoke any serious discomfort. In this sense, lifestyle changes for prevention are extremely important, especially with regard to diet, exercise, and healthy habits. Moreover, a woman may seek ways to complement these lifestyle approaches with the use of supplements that help to enhance the endocrine system and, therefore, help to prevent or ease symptoms of hormonal imbalance like uterine fibroids. For women who have already developed uterine fibroids and their associated symptoms, prevention may no longer be possible. Fortunately, there are many ways to manage the disorder in order to prevent the pain from getting worse or to slow down the fibroids' growth. 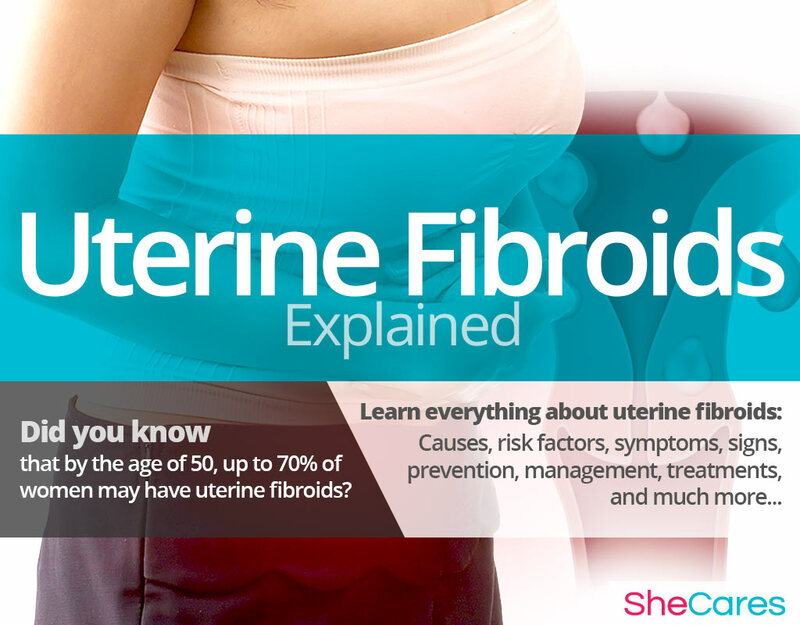 Keep reading to learn about the different ways to manage uterine fibroids. Women who have already developed uterine fibroids may find their quality of life affected by pelvic pain, chronic incontinence, or heavy menstrual bleeding. Fortunately, there are effective ways to manage these symptoms. Making minor daily changes can make a huge difference for women who are trying to manage uterine fibroids. While these measures often help to reduce the frequency and intensity of symptoms caused by uterine fibroids, they are unable to treat the root of the problem, which is hormonal imbalance. However, there are several natural treatments that can address the hormonal causes behind the appearance of uterine fibroids. Keep reading to learn more about treatment approaches for uterine fibroids. Because their causes tend to be complex, and it is a chronic condition, uterine fibroids can be a heavy burden to carry for some women. Luckily, it is more than possible to find an effective treatment for uterine fibroids. Three levels of approaches can be considered for treating uterine fibroids. These are categorized as: (1) Lifestyle Changes, (2) Alternative Medicine, and (3) Pharmaceutical and Surgical Options. Women are encouraged to begin with the least risky approach to uterine fibroid treatment, lifestyle adjustments. While these are often effective at curbing the disorder, they alone do nothing to address the most common cause of uterine fibroids - hormonal imbalance. Fortunately, alternative medicine can be combined with lifestyle changes to provide a safe and effective way to treat uterine fibroids. 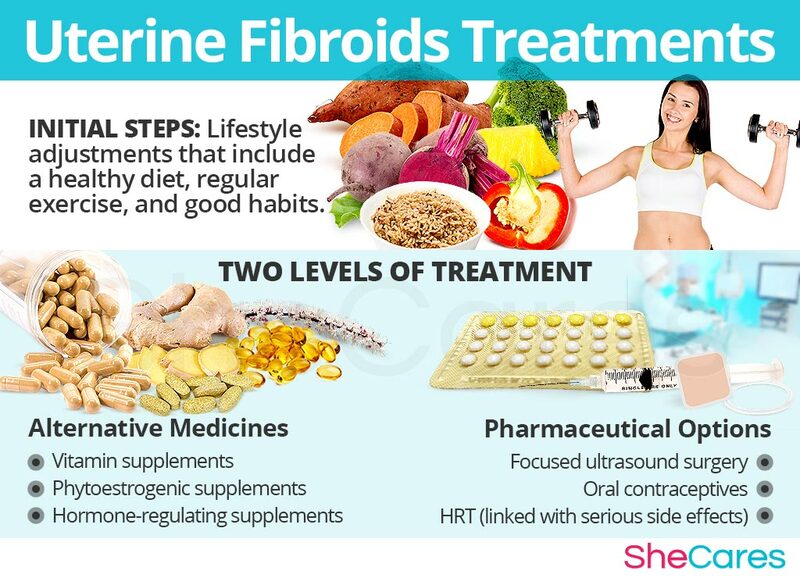 While medical intervention is not usually necessary to treat uterine fibroids, some women may wish to consider drugs or surgery if they are unable to find relief from natural treatments. This primary level of treatment involves the least amount of risk, though conversely it requires the highest amount of self-discipline. 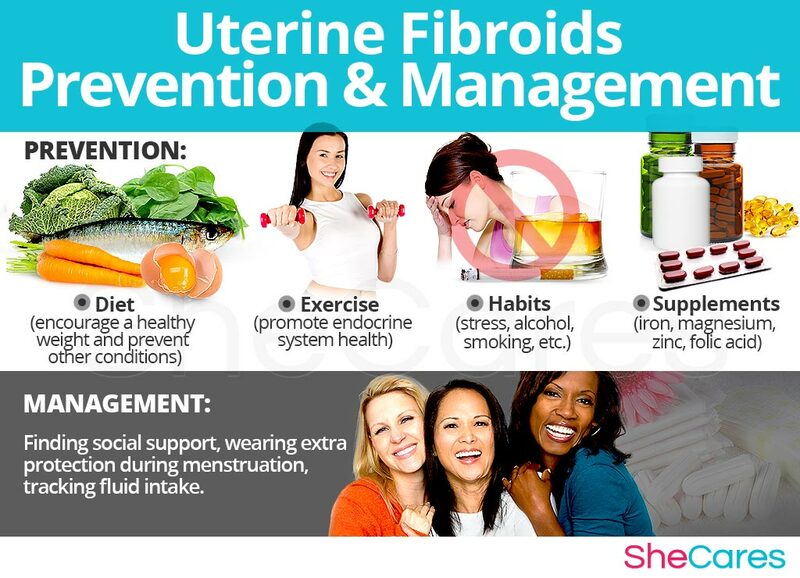 Many times some simple changes in lifestyle can reap huge benefits in fighting discomfort caused by uterine fibroids and achieving a higher overall level of health. Fundamentally, an improved diet, regular exercise, and healthy habits can do a woman great service. While these changes will help alleviate the discomfort caused by uterine fibroids, they do not address the problem directly, and so, further treatment may be necessary. Alternative medicine has proven to be excellent for treating uterine fibroids in a safe and natural way. Alternative approaches involve little to no risk and can be an extremely effective way to treat fibroids, either by slowing down their growth and making them dissolve or by providing relief from their symptoms. Herbal supplements are the most prominent, and there are three main types: hormone-regulating supplements, vitamin supplements, and other herbal supplements. Hormone-regulating supplements. This is regarded as the best natural treatment course for women who wish to address the underlying hormonal imbalance directly, instead of just treating the symptoms. Macafem. It works by stimulating a woman's hormone production by nourishing the pituitary and endocrine glands, causing them to more efficiently produce natural hormones in the right amounts. This ultimately results in balancing estrogen levels in relation to the other hormones, inhibiting the growth of the uterine fibroids so they don't become a threat and don't start causing any uncomfortable symptoms. For women who have gone through menopause already, Macafem has been reported to dramatically increase their chances of having their uterine fibroids dissolve naturally. Vitamin supplements. Some vitamin supplements can reduce the severity of the symptoms of uterine fibroids and make them less bothersome, but they are unlikely to slow down their growth. Vitamin C. Vitamin C is a water-soluble antioxidant that strengthens immune system and protects the body from harmful heavy metals. In addition, it favors the absorption of iron, which can reduce fatigue and general malaise for women who are experiencing heavy menstrual bleeding. Vitamin A. This vitamin can be beneficial in strengthening the immune system, and it also plays a part in promoting eye and uterine tissue repair. Women who experience problems with incontinence related to their uterine fibroids may find they experience less frequent urinary tract infections if they keep adequate levels of vitamin A.
Vitamin D. A recent study reviewed by the National Institute of Health found vitamin D may be linked in the reduction of uterine fibroids in rats. Herbal supplements. Evidence exists that certain herbal supplements can minimize the symptoms of uterine fibroids. Goldenseal Root. This herb has been traditionally used by Canadian First Nations as an antibiotic, antimicrobial, and anti-inflammatory agent. In particular, the latter property is believed to help in lessening certain symptoms of uterine fibroids, such as pelvic pain. Ginger Root. Several trials point out that ginger can promote good circulation all over the body, which, in turn, decreases inflammation, especially in the uterus, ovaries, and fallopian tubes. A combination of approaches is usually the most effective route to take. Lifestyle changes combined with alternative medicine will most likely be the best way to alleviate the symptoms of uterine fibroids. However, for some women, the symptoms will be so severe that a more drastic treatment will be required. Interventions at the third level involve the highest risk and often the highest costs. Not all treatments are suitable for women at every life stage. So, it is strongly recommended to speak to a licensed healthcare practitioner before starting any such treatments for uterine fibroids. There are two main types of medical options that can be applied for uterine fibroids, include hormone-regulating medications, which are usually prescribed to slow down their growth and surgical removal options that are reserved for cases when the fibroids have grown excessively big or are causing very severe symptoms. These three levels of approaches are not mutually exclusive. A woman may use different approaches at different times or any combination of them, depending on the duration and severity of symptoms. Today, more and more women find that dealing with symptoms of hormonal imbalance is best accomplished via a combination of healthy lifestyle and alternative treatments. Page, L.R. (1997). Renewing Female Balance. California: Healthy Healing Publications, Inc. Available from Google Books.